A Crazy Canuck Living in Zany Italia! : Loverboy Silvio! 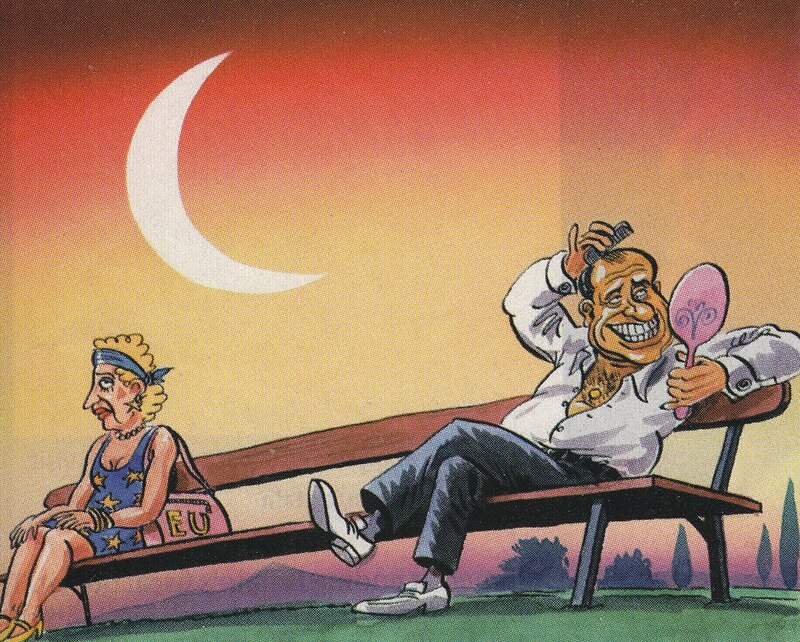 As usual, The Economist has a very high “esteem” for our Great Leader, Silvio Berlusconi (as you can see from the sarcastic cartoon from the July 31st edition depicting poor Silvio as the usual Latin Lover!). Here Italy’s less-than brilliant track-record of foreign relations, or better, LACK of foreign relations, is analysed by the British magazine. “In the 1990s a study by Federiga Bindi, an international-relations analyst, identified other barriers to an effective European policy in Italy: a high turnover of governments; coalition partners with conflicting aims; the failure of bureaucrats to learn from other member states; and politicians’ lack of interest in Europe….In Italy, politics never stops, and so policy is sidelined. In an atmosphere of continual warfare (!!!) between and within parties, in which every politician from the humblest deputy to the prime minister is looking out for opportunities to best rivals, EU strategy can seem marginal. Senior positions in European institutions hold little attraction for Italian politicians…Ms. Bindi writes that the so-called Lamassoure report, which three years ago confirmed a cut in Italy’s representation in the European Parliament, was approved at a council meting while the Italian delegates were out of the room dealing with their latest political crisis at home. Her recent study ends on an exasperated note: “Italy appears to be stuck in the age of the Guelphs and the Ghibellines, in which the victory of one faction over another is what counts, and the fact that this may be damaging to the country matters little”. I would go an inch further by quoting what the Italian diplomat Giandomenico Picco once said regarding foreign affairs in Italy (he hails from the Friuli region of Italy and was Perez de Cuellar’s former right-hand man at the U.N. when the Peruvian diplomat had been the U.N.’s Secretary-General. He also worked behind the curtains during the release of U.S. hostages in Lebanon and was rewarded for his efforts by the U.S. President): “For many Italian politicians, foreign affairs is nothing more than just a ‘hobby’”! And doesn’t THAT say it all about Italy….